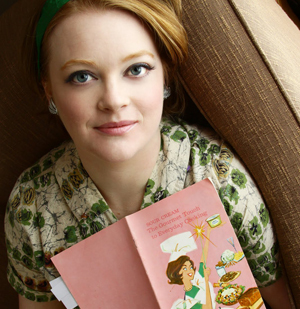 Welcome to this week’s Mid-Century Menu, the special portion of my blog where I choose a hilarious or crazy recipe from my vintage cookbook collection, cook it exactly as the recipe tells me (no matter how horrible), and then serve it up for dinner. 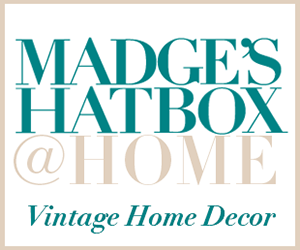 My husband has choked down more than his fair share of horrible creations thanks to this part of the blog. And I don’t plan on letting up any time soon. 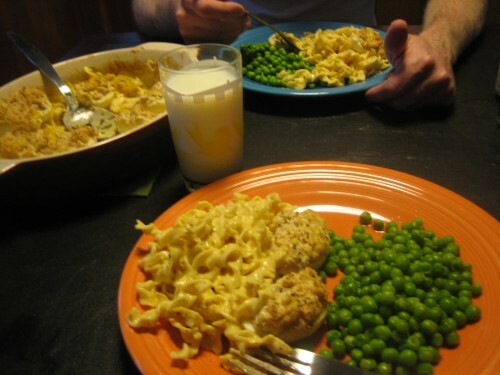 This week’s “fun” recipe comes from the PET Milk Cookbook, Warm Weather Meals for 2 or 4 or 6. 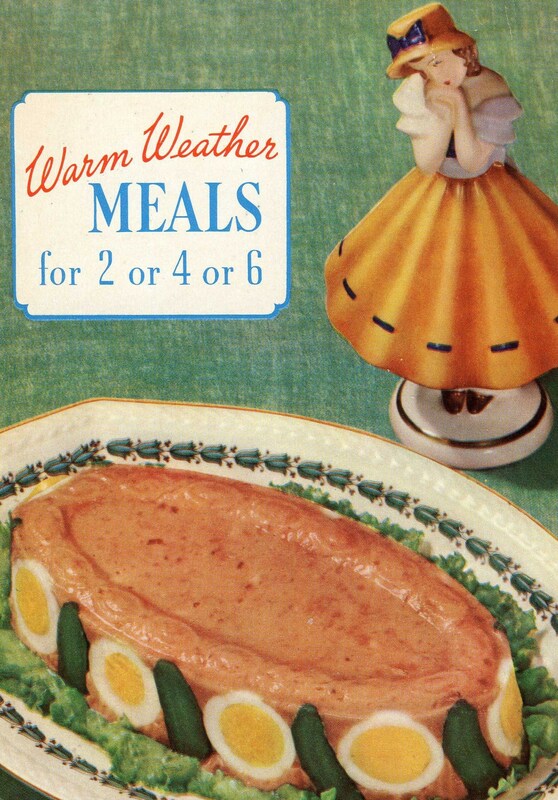 You may recall this book as being the origin of Meatloaf Nests with Creamed Peas, also known as the best Mid-Century meal to date. I picked another Warm Weather recipe for this week, hoping that by some miracle we could get another good meal. Well, the idea had potential. Right? 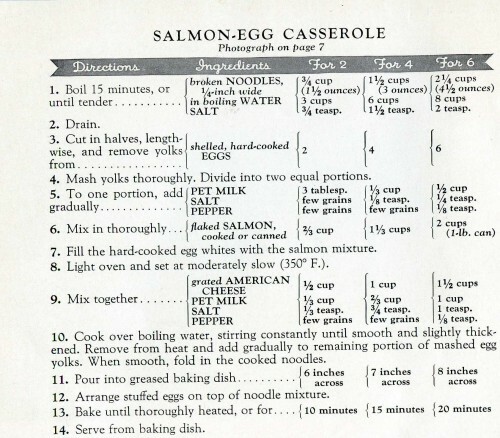 Anyway, if you recall, this cookbook was published in 1938 and is one of the oldest recipes to appear on this blog. 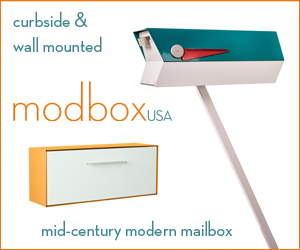 As I mentioned before, calling this Mid-Century is really pushing it, but I just loved some of the pictures and recipes in this book. 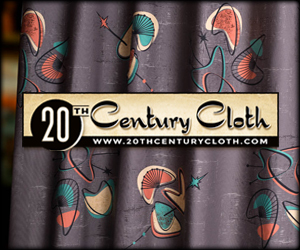 I mean, take a look at the lovely image to the left, which is the back cover of the book. Check out all those pickles and eggs. That little china girl is just in raptures over it. And yes, that is a molded gelatin salmon salad. Using canned salmon. 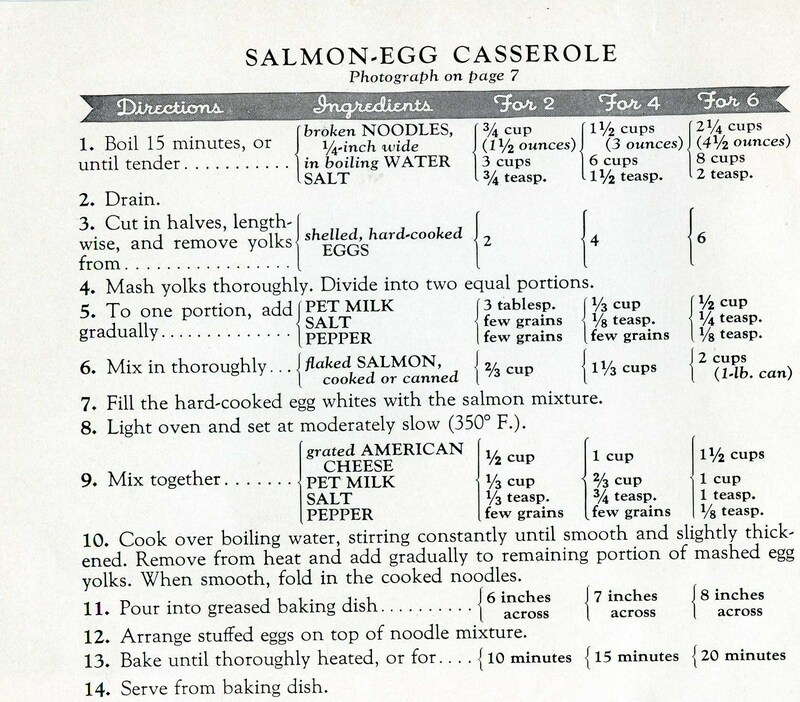 In any case, the recipe chosen for this week is Salmon Egg Casserole. I am not a huge fan of canned salmon to begin with, so I wasn’t too keen on trying this one. 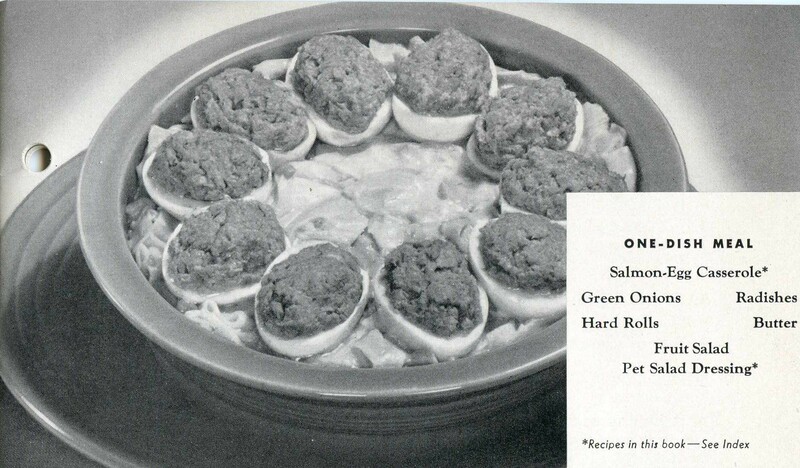 But Tom was pretty excited by the prospect of canned salmon stuffed into hard-boiled eggs, so we decided to give it a try. Pretty appetizing, huh? Those little eggs are almost enough to make me wonder what I was thinking. Maybe we just picked this one because it is served in Fiesta. Yes. That has to be it. Even though the title of this book is Warm Weather Meals, I don’t find these any different from regular meals in terms of ease or oven usage. 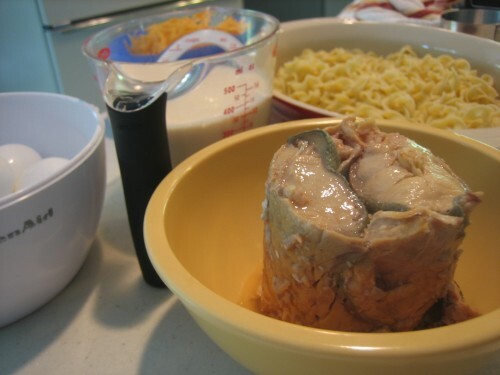 In fact, I used both the oven and the stove to make the Meatloaf Nests, which is more than I do for a meal in winter. So, I am going to count how many times the heat is on, so to speak, for this recipe. And we will see whether or not it is considered a warm weather meal. Only 14 easy steps! Let’s do this. Heat use #1! 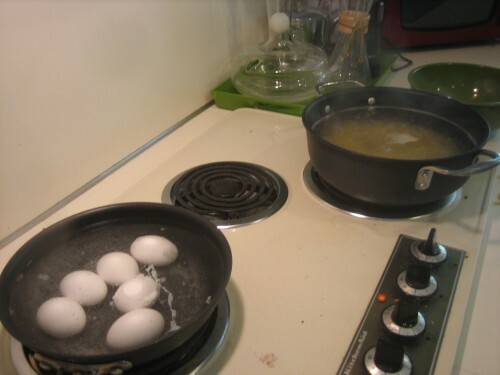 Cooking the noodles and the hard-boiled eggs. I am only counting this as one since I did them both at once. Look at those happy little eggs cooking away. They have no idea that in 30 minutes they are going to be stuffed with canned salmon. Ahhh…blissful ignorance. Ingredient roll call. Looks kind of bland, doesn’t it? Except forrrrrrrrrrr…oh, I don’t know, the slimy hunk of canned salmon! Ugh! I tried to go for authenticity here by buying the old-school canned salmon, but it looks like it is mostly just skin and bones. No real salmon to speak of. Separated hard-boiled whites and yolks. There is a hilarious story that goes with this picture. 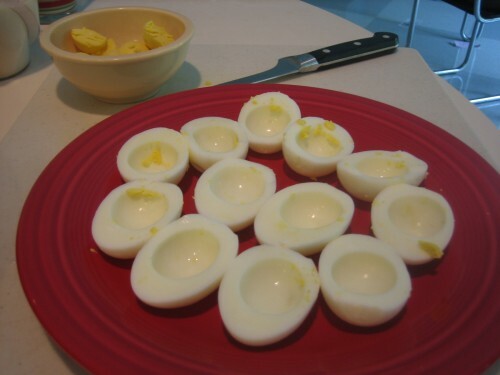 I was running cold water over the hard-boiled eggs to speed cooling, when I started to hear a strange sound. Almost like…chirping. I walked to the window. The chirping got quieter. I walked back to the sink. The chirping got louder. I leaned my head down to the strainer containing the cooked eggs. After I stopped hysterically screaming, I thought about it reasonably. Okay, these eggs have been in the refrigerated section for at least a few weeks. I boiled them for 14 minutes. There is no way, no possible way, that there is a chick alive inside these eggs. No way. Still, the chirping continued, more feeble now. With all the leftover courage I could muster (I used up a lot on the nasty salmon. I totally plunged my hand into that mass and deboned and skinned it. Thank you very much.) I picked up each egg, put it to my ear, then shook it and cracked it. As you can see from the picture, none held a chick. Thank goodness. The chirping must have been caused by the cooling shells, but it certainly freaked me out. I dried my tears and separated the chick-free eggs, letting out a little sigh of relief every time a white split open to reveal a solid yellow yolk. Whew. And no, I am not dramatic. Heat use #2! 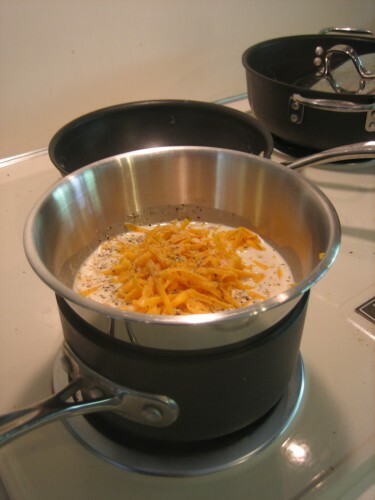 Cooking up the cheese sauce for the noodle base. Notice the makeshift double-boiler. Seems like a good idea, but baby, that bowl got hot! 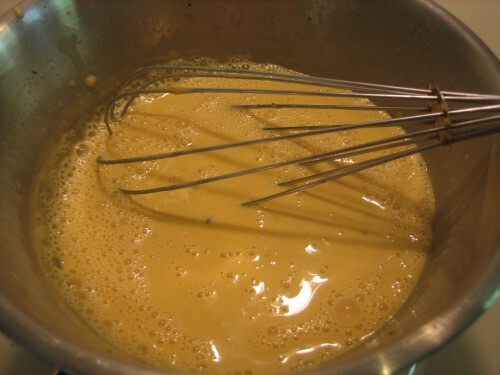 The cheese sauce, melted and together. It got smooth and slightly thicker after only a few more minutes, but then I added the egg yolks to it and I couldn’t get it smooth again. 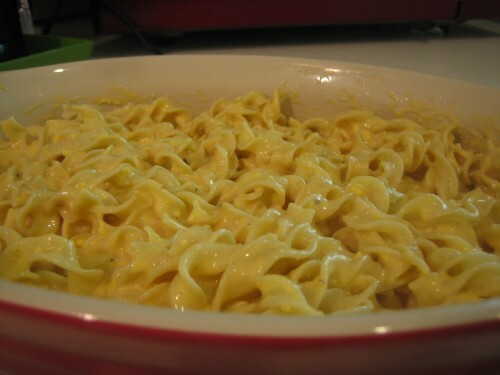 The noodles covered with cheese sauce. Part one of the recipe successfully completed. 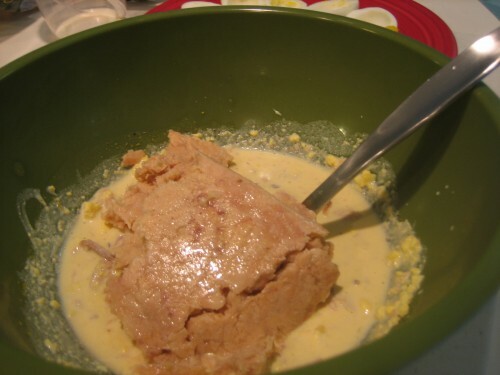 The stuffed egg filling. What you are seeing is a skinned and boned pouch of salmon that I picked up just in case the canned salmon didn’t work. Which it didn’t. But some of the canned salmon is actually in there, too. After all the plunging in of hands and pulling off of skin and bones, the canned salmon only yielded about 1/4 of a cup of useable salmon. Hooray. Thank goodness for the backup plan. 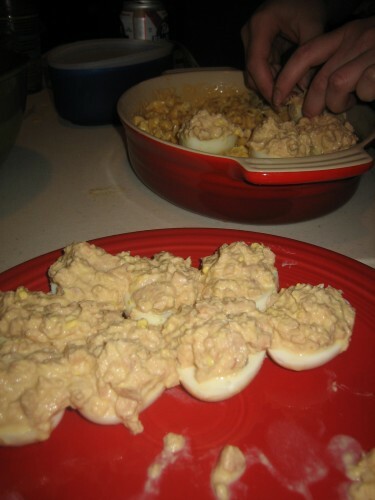 The stuffed salmon eggs being carefully placed on the noodle base. I have a question for you to ponder. 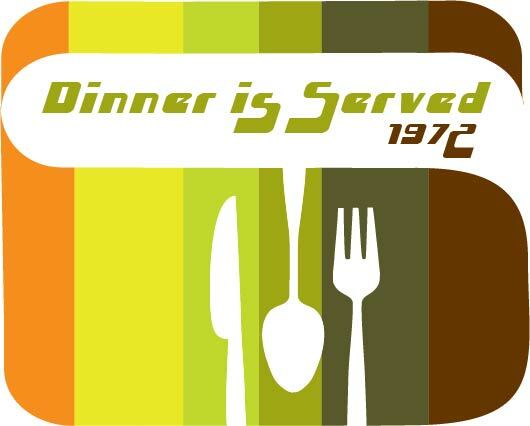 How come over half my mid-century meals look they are stuffed with brains when I am done? Look at that salmon stuffing. Nasty. Ready for the oven. Wow. Look at how bland it looks. No real color at all. Heat use #3! 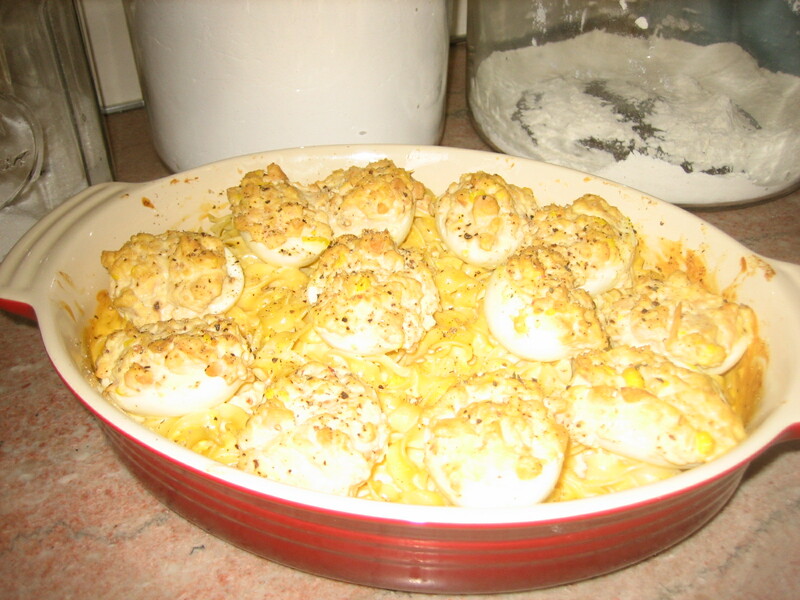 The casserole after being baked in the oven. Not sure if this improved it at all, but there you go. Getting ready to be eaten, with the required green veggie and glass of milk. You can’t see it in the picture, but Tom has a beer on the other side of his plate, just in case. 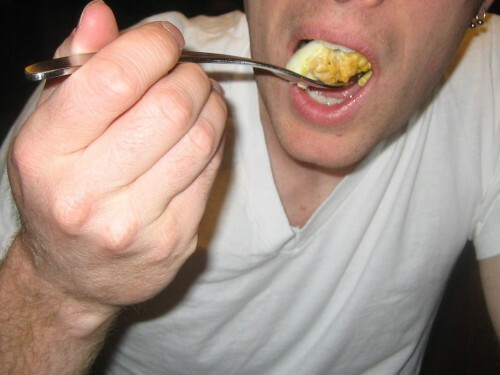 Tom taking the first bite. My hero. After chewing for a while, he made a face and then swallowed. “Is it bad?” I asked. I didn’t really have high hopes anymore. He was right. The egg/salmon concoction didn’t taste like anything at all, except for a little fish aftertaste. The cheesy noodles, though, were incredibly salty! The verdict: Edible, but salty and disappointing. I was kind of sad about this verdict, because this one was a lot of work and I had high hopes for it after the way the Meatloaf Nests turned out. 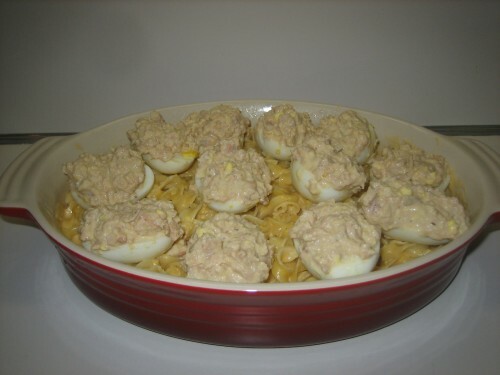 But the stuffed eggs were practically tasteless, and the noodles just tasted like salt. On top of that, I had to use a heat source a whopping 3 times for one dish. Not a good warm weather meal, if you ask me. Maybe I should have made the salmon gelatin salad instead. Gah! You poor thing! I also would have been really freaked out over chirping eggs, just knowing that I was about to find something horrible! Canned salmon looks and smells SO gross. The recipe left me at the gates right there. thanks for posting this! I made this for my family and, taking your critique into account, changed the recipe a bit. it was delicious! 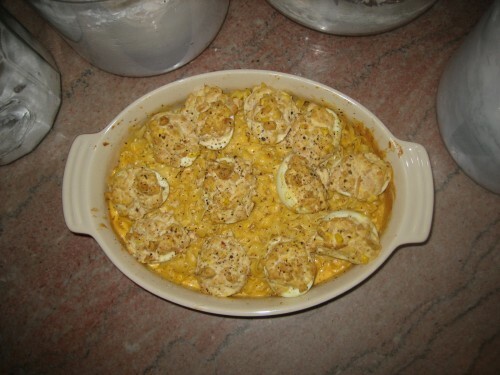 i used sharp cheddar instead of american cheese, some smoked salmon for the filling, regular milk with a little unflavoured gelatin (we had no evaporated milk), added onion powder, mustard powder, paprika, more black pepper, oregano, soy sauce. reduced the salt. omnomnomnom!